Here in 2015, there’s lots of talk about whether downtown Columbia should sport so many high-rise apartment buildings, but in 1910, another high-rise faced a different kind of problem — a shortage of steel. The Guitar Building — which has nothing to do with guitars — at 28 N. Eighth St. was spotlighted in the April 2015 edition of the Columbia Business Times. It was also the subject of “Booches, Guitar Building rack up years downtown,” a column written by Warren Dalton and published on August 29, 2010 in the Columbia Daily Tribune. 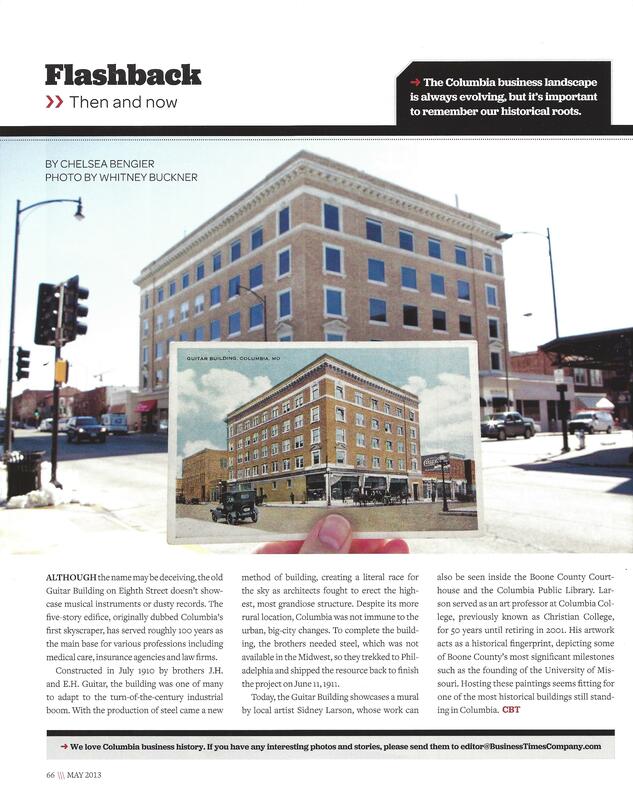 Guitar Building, 22 N. Eighth St., historic image and present image, highlighted in article the April 2015 edition of the Columbia Business Times, used with permission. This is one of the important reasons for this site that catalogs information on historic buildings in Columbia, Missouri. Information on Columbia’s history is often revealed in many the city’s publications, but finding everything published on any one location can be difficult. Do you have information on this building you’d like highlighted? Is there a clue or historical fact on this or any other building in Columbia you want to share? I’d love to hear it, either via comments of to me at dobrien387@gmail.com. Or perhaps you’re not keen on high-rise buildings now — or then. Let me know. The Columbia Business Times article notes the building today “showcases a mural by local artist Sidney Larson, whose work can also be seen inside the Boone County Courthouse and the Columbia Public Library.” Here’s more information about the mural and other downtown murals in this City of Columbia Murals of Note document. Neither article notes whether this 1911 high-rise was greeted with fanfare or frowns, but nearly 100 years later, few would call it a high-rise or even raise an eyebrow if such a five-story building were proposed today — if it weren’t planned for the same spot as another Columbia icon at least. Have you ever wondered about the history of your home, neighborhood or one you drive by or see often? Here’s your chance to learn how to uncover the history all around you. Deb Sheals, an architectural historian and historic preservation consultant will be giving a free talk at 7 p.m. on Tuesday, June 18, 2013 at the Columbia Public Library in the Friends Room. The library’s calendar notes she’ll explain what records to look for to date historic houses and identify their early owners and occupants and where to find records online and locally. This talk could help you unearth equally interesting information about your own area. What kinds of historic things have you learned about your home, neighborhood or areas you frequent? What records did you use or uncover? In a way, a piece of history is about to meet its demise, this time a landmark of black history. The Annie Fisher Home at 2911 Old Highway 63 South is now slated for demolition. Yet, in some ways, the history of Annie Fisher and her accomplishments will live on. For now, the former location for a restaurant and catering service operated by Annie Fisher, a black entrepreneur born in 1867, is in danger of being torn down. The home, built in the 1920s, is now sandwiched between large apartment buildings. The two-story, window-filled grand building is now owned by Merle and Charlotte Smarr. The Smarrs have filed a request for permission to demolish the house, according to August 18 2011 article in the Columbia Daily Tribune, and the 10-day waiting period for the Columbia Historic Preservation Commission to take action has passed. 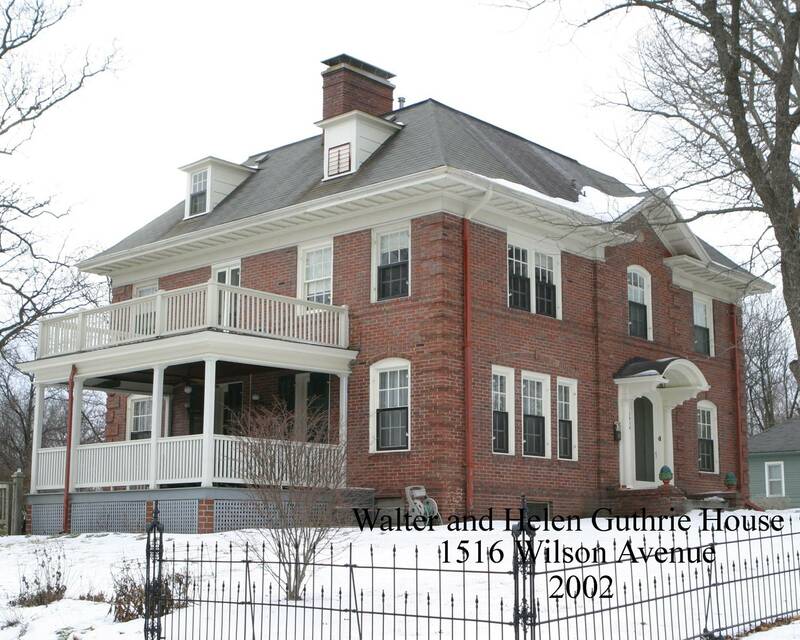 The Historic Preservation Commission named the house to the Notable Properties list in 2009. This will be the second home of Annie Fisher that has fallen to the wrecking ball and the second that has fallen to the results of changes in Columbia. A 15-room home she built earlier at 608 East Park Avenue was torn down in the 1960s as a part of a 1960s urban renewal project, according to 2009 Columbia Housing Authority document. Yet, even if this home, too, is demolished, the story of Fisher’s success and life will remain with us. Sept. 22, 2011 — A discussion of the Columbia Public Library’s One Read selection, “The Immortal Life of Henrietta Lacks” by Rebecca Skloot at 7 p.m. on Thursday, September 22, 2011 in the Columbia Public Library, Friends Room will include a discussion of Annie Fisher, Blind Boone, Douglas Park and the Sharp End, using historical photos and documents. 2010 — A Facebook page dedicated to the Annie Fisher House Project includes a video tour of the home as well as historical documents. 2009 — This You Tube video on City Scope: Annie Fisher, Cateress of Columbia, narrated by Bill Thompson notes the house has 81 windows. Thompson says she put so many windows because she wanted the people eating at her restaurant to be able to look out at the beauty of Columbia and Boone County. The house has had many champions, most recently Sheila Kitchen Ruffin, who in 2010 founded the Annie Fisher Project to save the home. According to the August 18, 2011 report, Ruffin has been unable to drum up necessary support for the project. The June 17, 1938 article from The Call announced her death. “Mrs. Annie Fisher, Famed ‘Beaten Biscuit Woman’ of Columbia, MO., Succumbs.” It goes on to note she died at her home at 608 Park Avenue at age 71. The article also includes information on the building at 2911 Old Highway 63 South, stating, “Twelve years ago she opened a dining room on highway 63, about a mile and half south of Columbia.” That would be the home now in danger of demolition. Fisher, according to the article on black neighborhoods, “was world-renowned for her beaten biscuit recipe, which won her a first-place award at the 1904 World’s Fair.” She had a catering business which she used to pay for the Park Avenue home and then later the Highway 63 home. Harris-Laboy, who researched Fisher and often dressed up as her for presentations at local schools, said Fisher was born in 1867 and only received a third-grade education. ”Fisher also had china and silverware to accommodate 1,000 people (she rented her supplies out when she wasn’t serving a party) and a mail-order business. Her courage and business acumen would be extraordinary at any time but are particularly remarkable for a black woman of her time and place,” notes the article written by Christina George. On Feb. 17, 2011, The Story of Blind Boone, will be presented at 7 p.m. Thursday in the Daniel Boone Regional Library. Mike Shaw will discuss ragtime musician John William “Blind” Boone, one of Columbia’s most famous residents and give an update on the restoration of his historic Columbia home. How could this be the cure to depression? The house at 10 N. Fourth St. is literally a monument to endurance, caring for each other and going beyond limitations. Boone, born in 1864 of a union between a former slave and a Civil War soldier, is proof that care and concern stepped beyond what should be. There is some evidence that his father sought to return to the mother of his child despite the chaos and demands of his military service requirements during the Civil War. Again, signs of care and concern. The list could go on but even the home shows the way to believing in a better life. Boone’s home until 1927 at 10 N. Fourth St., once nearly derelict now has been renovated through the efforts of Columbia’s community members and is slated to become a museum with interactive displays. On Thursday, Feb. 17, hear more about continuing renovation efforts and get rid of any remaining winter time blues by learning that care and concern can overcome any limitations. The presentation will be in the Columbia Public Library at 100 W. Broadway.